Despite the strikingly ill-advised visual design, Popo is a recurrent Dragonball character. He first appeared in 1988, and works for the Guardian of Earth. Base Of Operations: Almighty’s Palace, over the Sacred Land. Height: Around 5’ Weight: Around 150 lbs. Doesn’t makes a sound when moving. Can digest and return energy blasts. Detects vital and mystic signatures. Can even speak with animals and plants. He is a very good inventor, capable of developing, with time, the most fantastic of gadgets. Yet he prefers lighter things like taking care of God’s Garden, talking to the birds… or showing an eager young Saiyan there are powers above his. 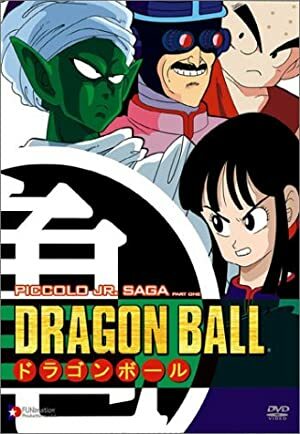 Songoku fought Piccolo Sr. and defeated him. But Songoku was required at the Sacred Tower for an important mission. At the top of the Tower, guardian Karin informed him he had to go still higher. On the roof of the Tower’s Palace there was a small hole. Songoku’s Nioi-Bo, once placed there, stretched to fulfill its true mission: taking its owner’s to the Almighty’s Palace. That way Songoku arrived at the top of the top, the huge hovering bowl-like platform over which was God’s Palace stood. There Goku met this strange black man with wide-open eyes called Mr. Popo. He introduced himself as God’s servant and said that to met God, Goku first had to defeat him. Songoku thought it would be easy, but Popo’s super-senses and speed made him unbeatable. Finally, the Almighty himself appeared, much to Goku’s surprise. He was the twin of Piccolo Sr. Since then, Popo has trained Songoku, Ten Xin Han, Yamxa, Chaos and Krilin. He has taught them to move in a hostile environment (the palace is at a height of no less than 30 miles high), to use other senses than sight and to search for inner peace and inner energy. 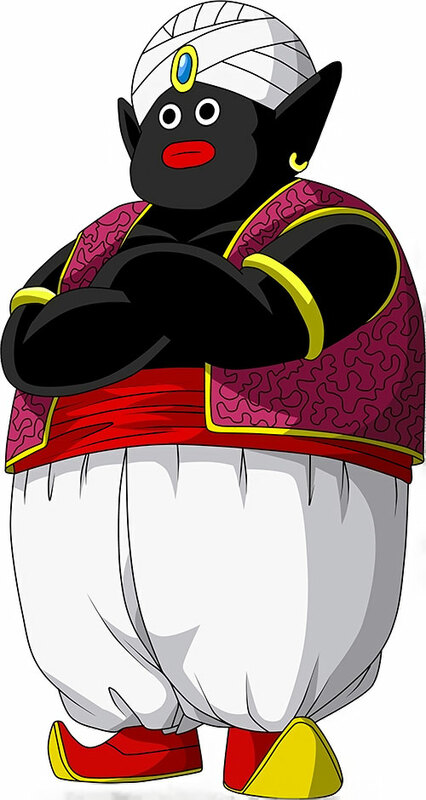 Popo is a short man with pitch-black skin. He wears a turban on his head and a waistcoat and white trousers and shoes of Arabian design. His left ear shows an earring. Popo has always his eyes wide open, because he’s always concentrated. His voice is warm, deep, calmed and soothing. At peace with the world, Popo’s a tad mysterious and a bit helpful. He’s a good teacher if the pupil really wants to learn, and does have a knack for creating things, arranging his garden and talking to birds that dare to go that high. He is really devoted to protecting the life of his master, the Almighty. Popo would have been the man who taught Richard Dragon everything he knew, replacing the O-Sensei. He could also train Lady Shiva and would be a central character in any major crisis requiring the heroes to save God. Animate Image works on sculptures instead of 2D images (-0). Detect has the Discern Bonus. Energy Absorption fuels Energy Blast. Energy Blast must be powered by Energy Absorption. Gravity Decrease has no Range. Invisibility (Sight) only works when running at more than 6 APs (-1). Life Sense’s range rises 1 AP for every round of concentration (+3). Martial Artist bonus to Initiative is +1 for every 4 APs (+1 FC or genre rule, as GM like). Magic Field is Minor Marginal (-1). Area Knowledge (God’s Palace), Genius, Immortal, Scholar (Gardening, Miniatures). The Almighty (High), Songoku (High), Goku’s Gang (High). MAGIC CARPET [STR 05 BODY 03, Flight (ML): 17, Shrinking (ML): 09, HP Cost: 276] Bonus: Flight doesn’t cause environmental disturbances, sonic booms or any kind of harmful effect (+2), Limitation: Shrinking reduces STR and Weight (-2)]. Another artifact used by Popo is a room sized machine that seems to send people to other places, with either [Illusion (ML): 20, 2 APs of Area effect] or [Remote Sensing (Transdimensional): 55, Teleportation: 45, Time Travel: 33]. He has the equivalent to a 60 APs Workshop/Lab, but only for non-offensive purposes. To make weapons or anything that targets BODY, MIND or SPIRIT to score RAPs of damage to any stat it only counts as 12 APs.